children from opening their seat belt, by covering the seat belt receiver. To remove Belt Lock, simply insert your vehicle key through the slot. to open their seat belt. 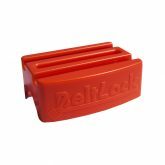 Belt-Lock is a secure seat belt buckle guard used to prevent children from opening their seat belt either intentionally or inadvertently. 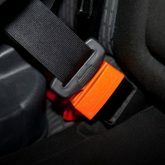 Simply place Belt-Lock over the seat belt receiver and close the seat belt normally. Due to its design Belt-Lock prevents the red release from button being pressed. 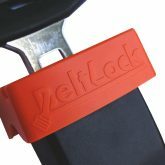 To open Belt-Lock simply use your vehicle key or similar object through the slot to depress the seat belt release button.